Another (Wine) World | Marbella Marbella – Adelante! In a restaurant where a few good ‘ole boys are gathered together to spend a convivial couple of hours, the most boring thing you can do is drink the same wine or wines throughout the meal. But that is precisely what most people do. Shame really as even the most pedestrian list usually features wines that we have probably never tasted before. Last weekend I was invited to one of those leisurely Sunday lunches where the conversation flows as easily as the wine, and in this case where the host had taken some trouble to put on some really interesting wines, with not one repetition. We started in Tenerife, and after a brief stopover in Mallorca, proceeded to Alicante, Valencia, Penedés, Priorato…… I think we finished somewhere around Valdeorras but cannot be sure. Nor does wine collector FranÇois Audouze repeat the wines he serves, since his Paris cellar contains more than 40,000 bottles, although this ex-steel industry executive empathises that it is not a museum, rather a moveable feast. Audouze had little interest in wine until one day, in his mid-twenties, he tasted a Chateau Climens Sauternes 1923. The experience was so profound as to be life-changing and as a result he decided he would spend the rest of his life searching out old wines. Audouze is generous enough to organise frequent dinners in the best hotels in Paris to enable his invited guests to taste what are probably the oldest wines in the world. Recently the Hôtel de Crillon was the scenario for a typical Audouze feast for ten guests at which the menu had been selected by the host in consultation with the Michelin-starred chef. Care is always taken to avoid serving dishes that may conflict with the wines. On this occasion oysters in green apple jelly were accompanied by Dom Perignon 1964 and Henriot Réserve de Philippe de Rothschild 1973. Then came Ch Haut-Brion Blanc 1966 with lobster ravioli, and a Petrus 1967 with red mullet. 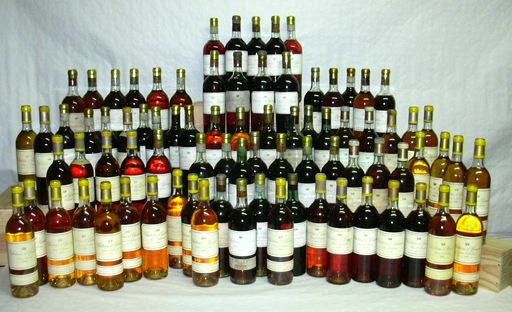 The wines that followed included Château Mouton-Rothschild 1982, La Tâche1983, and finally Château d’Yquem 1985. 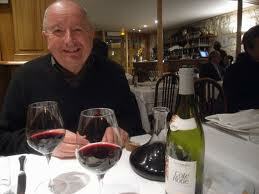 Audouze’s problem is that he has not got time to drink all the wines in is cellar. For example, his six bottles of Lafite Rothschild 1869 are priceless, and cost him a six figure sum when he acquired them long ago. He is thinking about staging a dinner that would feature wines salvaged from sunken ships, like the two bottles of 19th century champagne brought up from a Baltic Sea wreck he just bought.